Yowza! 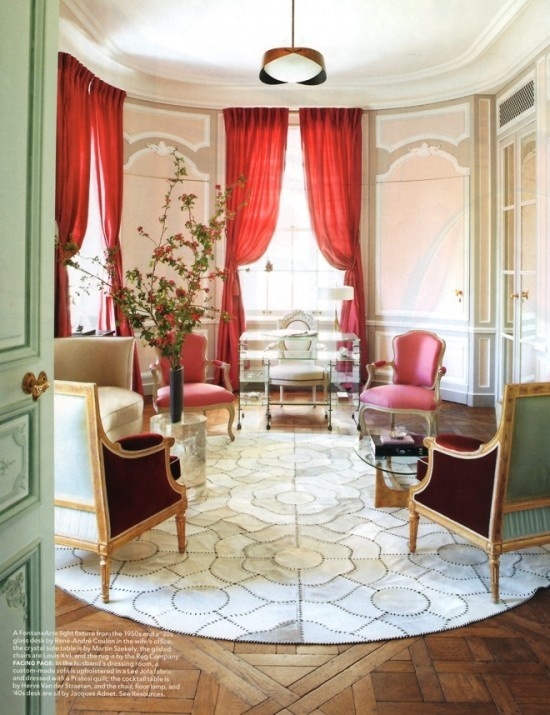 This is a whole lot of chic in one oval room. And the reason I flagged it is because I'd like to think that these are my nursery colors (and thus baby girl's "signature colors"...it's never too early to have your personal palette). Once you see the nursery you'll be all "Ummm...no, those aren't the same colors" but just go with it that my feature colors are red + pink + jade green and this room combines the hues so perfectly! My nursery uses the punchy versions of these colors with some yellow intermixed but I have to say that I've fallen in love with the combination. And though green and pink have always been some of my staples, I'm embracing red and yellow like never before. And I've never combined red and green thinking it was too "Christmasy"...but boy does it work. And totally appropriate for a Christmas baby. And now I've hijacked this post and made it a commentary on the nursery...not this incredible design by Robert Couturier...so let's comment on the floor pattern, rug, lucite desk, moulding and overall rich details. Stunning! Have a glorious weekend...see you Monday! I'm usually on board with everything you like. Let's just say usually and leave it at that! That(Lucite? )cylindrical table needs to come and live with me. I really like the palette, especially the walls. No one is ever too young to be chic. Where to start? That is a sick fur rug. Love the mix.